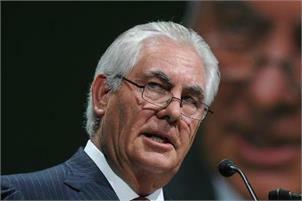 London, Sep 14 (AP) Secretary of State Rex Tillerson is holding talks in London with senior British and French officials on North Korea's nuclear and missile programs. All three nations are permanent members of the UN Security Council which this week approved new sanctions to punish Pyongyang's latest nuclear test explosion. The officials will also discuss the response to Hurricane Irma that has caused havoc in the southeastern United States and the Caribbean. They will then discuss the chaos in Libya with representatives from the UN, Italy, Egypt and the United Arab Emirates. It is Tillerson's second visit to Britain since taking office in February. His first meeting today was with British Prime Minister Theresa May. Before returning to Washington, Tillerson is due to address a press conference with his British counterpart Boris Johnson.